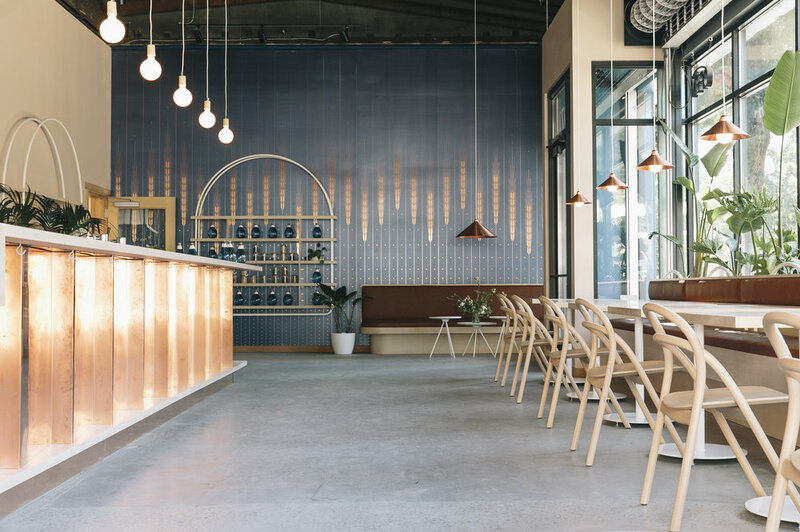 OSC collaborated as a multi-disciplinary team to create a uniquely refined tasting room for Freeland Spirits, one of the few womanowned distilleries in history. To tell the Freeland Spirits’ story, we developed subtle details throughout the space, offering visitors a full tactile and olfactory experience: the custom wallpaper designed in-house depicts the wheat imagery from the brand’s logo; custom shelving units were designed to display and support the distillery’s iconic glass bottles, as well as jars filled with botanicals used in distilling the spirits. By adding copper detailing throughout, the tasting room speaks to the massive copper stills that are framed and in full view behind the bar. OSC also collaborated with local women-owned businesses to develop the plant installation by Fieldwork Flowers, and a custom mural by Fruit Salad Club, which tells both the story and process of Freeland Spirits. Tasting Room interior and environmental design by OSC. Mural by Fruit Salad Club.